Cosmosapiens is a big-picture look at how human life emerged and evolved in the universe, incorporating the ideas of world-renowned experts from a wide range of intellectual disciplines. Who are we, and how did we get here? These are two of the most fundamental and far-reaching questions facing scientists and cosmologists alike and have rested at the center of human intellectual endeavor since its beginning. They are questions that stretch across numerous disciplines. Philosophy, theology, evolutionary biology, and mathematics are just some of the fields looking to explain the emergence of human life. But with so many groups seeking answers using so many different methods, it can be nearly impossible to tell what sort of progress has been made without stepping back and looking at the whole interdisciplinary picture. 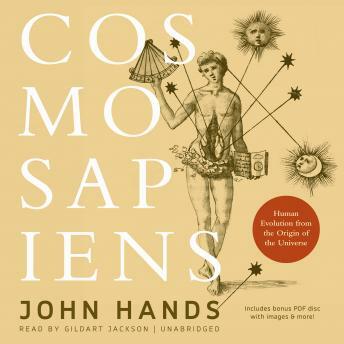 In Cosmosapiens, John Hands presents readers with exactly such a synthesis, ten years in the making and incorporating the ideas of world-renowned experts from wide array of fields. The book sifts the speculative from the firmly established, examining claims of all sorts, challenging the orthodox consensus in those branches of cosmology, biology, and neuroscience that have ossified into dogma. His striking analysis reveals underlying patterns of cooperation, complexification, and convergence that begin to tell the story of human emergence and consciousness. In the end, it will transform our understanding of what we are and how we evolved from the origin of the universe.